Mexican culture is steeped in tradition, one of my favorites being Dia de los Muertos. It follows a similar pattern to other cultural celebrations of ancestors who have died, but it seems to me the most festive party of its kind. You know that Day of the Dead iconography has really hit the big time when it's available in underpants. 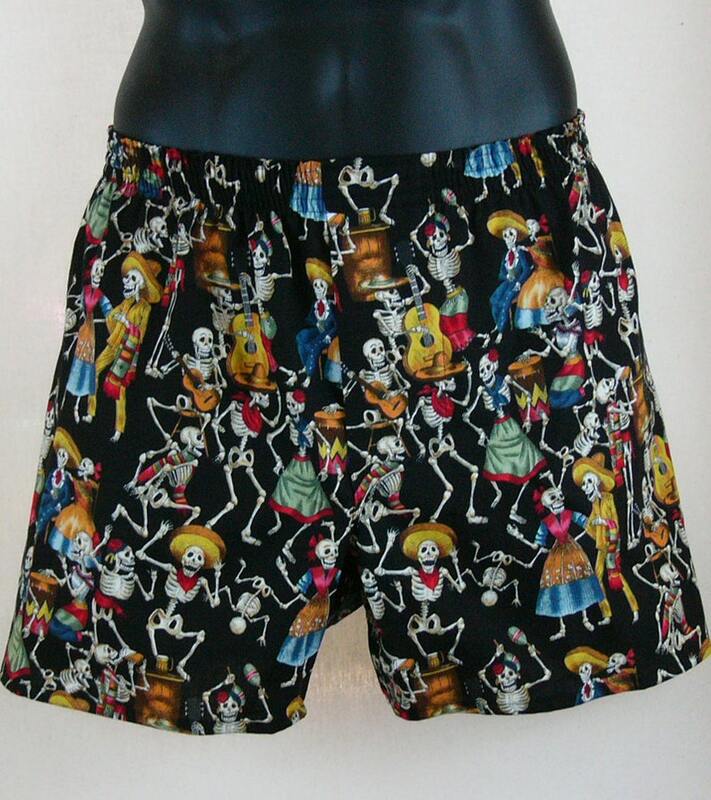 On the front of the wrapper you'll see the title - "DEAD MAN'S PARTY, or Pantalones de los Muertos"
All of my boxers are full-cut with a three-panel design (no center back seam) and a functional fly. I make all of my products in a smoke-free home, I only use woven 100% quilter's quality cottons, I prewash all fabrics before I cut so the finished garment stays true-to-size, and all interior seams are finished by flat-felling. These are some quality underpants... your dear departed ancestors would definitely approve! Great quality, they fit really well and I got them super fast!